On assignment to write/produce/direct a mini-documentary in Vietnam for East Meets West Foundation (EMWF), a humanitarian NGO that established programs for severely disabled offspring of Agent Orange survivors and others with disabilities. I asked EMWF staff in Hanoi how they feel about Americans today. 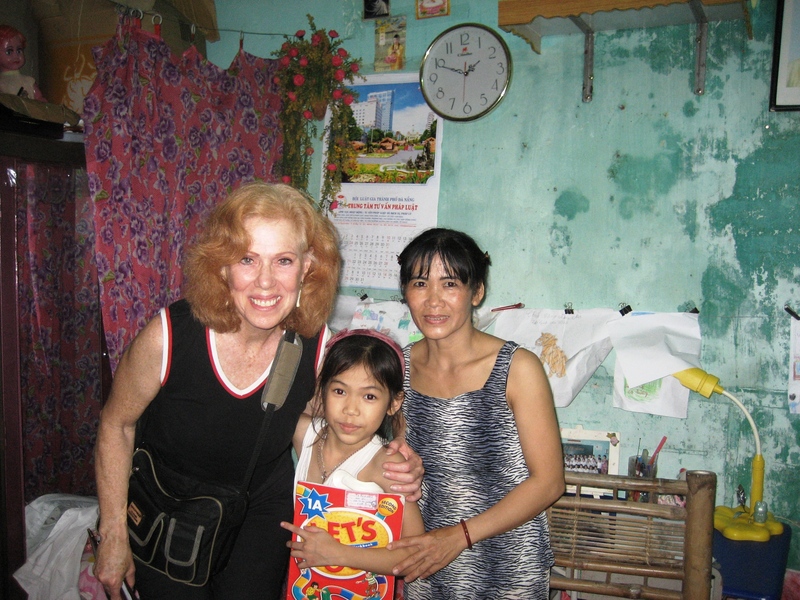 The program development director, in her late 30s, was a toddler during “The American War.” At one point in the bombing, she and her parents had to evacuate Hanoi on the back of a water buffalo. They returned to devastation. “We have moved on,” she said. “We are not looking back, we cannot change what happened. We are focused on healing and re-building our country. We don’t blame the war on the American people; we know that many were against it. We hold the American government responsible. Now we welcome Americans, they help our economy.” This may be the Buddhist way: look to the future, heal, re-build, find the positive. Staff from EMWF drive me and my cameraman to four sites where we experience the human wreckage from AO in children and adults. 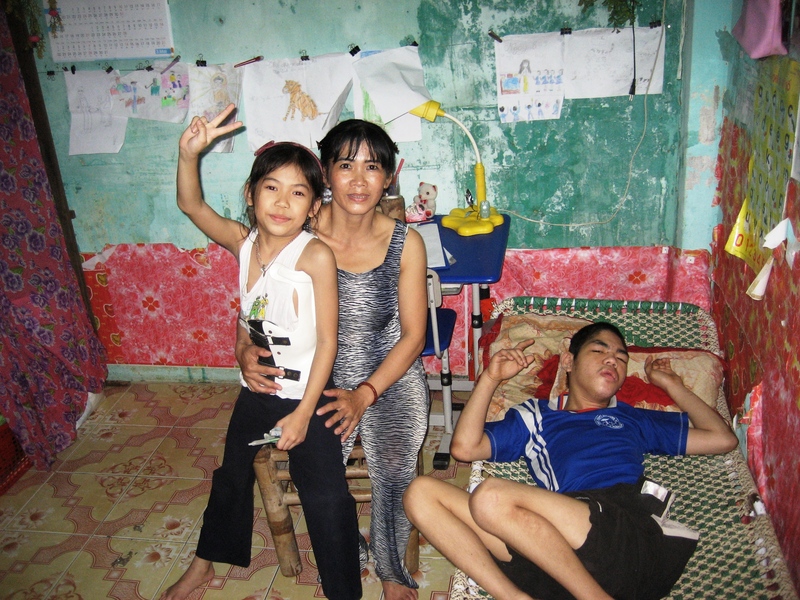 Although some severely disabled are not offspring of parents exposed to dioxin, most are. One rehab center is filled with children and adults engaged in various types of therapy to build their strength and stamina while parents watch or assist. At Da Nang’s modern rehab hospital, a crowd of parents bring their sweet, well-behaved youngsters born with serious birth defects into the hospital’s huge rehab room. The children are placed on a large, raised mat where physiotherapists administer gentle exercise therapy while parents observe or learn what to do to help their children. One deformed four-year-old walking with a limp has a big hump in the middle of her back; another has deformed feet and missing fingers. Everyone is quiet, respectful, gentle. They smile at me and the cameraman. The scene is heart-wrenching. Our third stop is a visit to a recipient family’s “home.” We walk up an alley to a one-room windowless hovel the size of a kitchenette (9m square) where a single mother and her three young children are living like cell inmates. I see a kitchen sink and a curtain that encloses a tiny area serving as both shower and bathroom. A rusty old bike is propped outside the door, their only transportation. Mrs. Thuong, a gracious 44-year-old mother with a friendly smile, greets us warmly and offers water and tangerines, all she has. Her teenage son–deaf, blind and immobile with cerebral palsy– lays like a vegetable on the only bed, which is made of straw. The other three sleep on the floor. Her disabled daughter, eight-year-old Phuong, wears a plastic spine prosthesis around her midriff to help correct a backbone birth deformity. She is a bundle of energy hugging and drawing pictures for us at her little wooden desk. She is very bright, receiving a three-year scholarship from EMWF that includes school supplies and the prosthesis for her and a forthcoming wheel chair for her brother. The youngest child was at school. 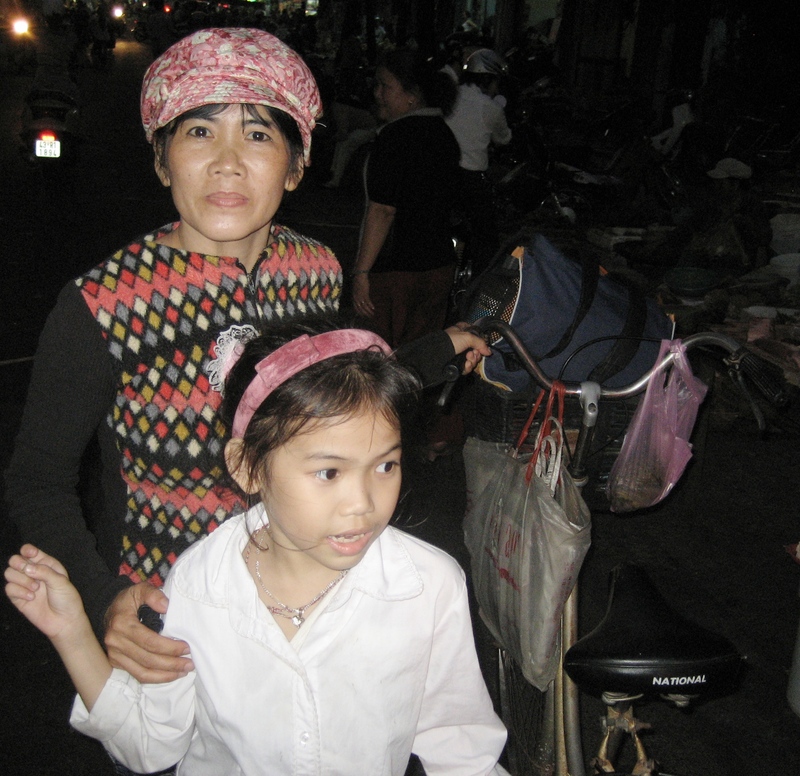 The father is imprisoned for six years for causing a truck accident (details unknown), so Mrs. Thuong must work. She’s a garbage collector, the lowest of jobs, earning $38/month (USD). We videotape the “home” and the family, but I decide against an interview in the claustrophobic room off a noisy alley. 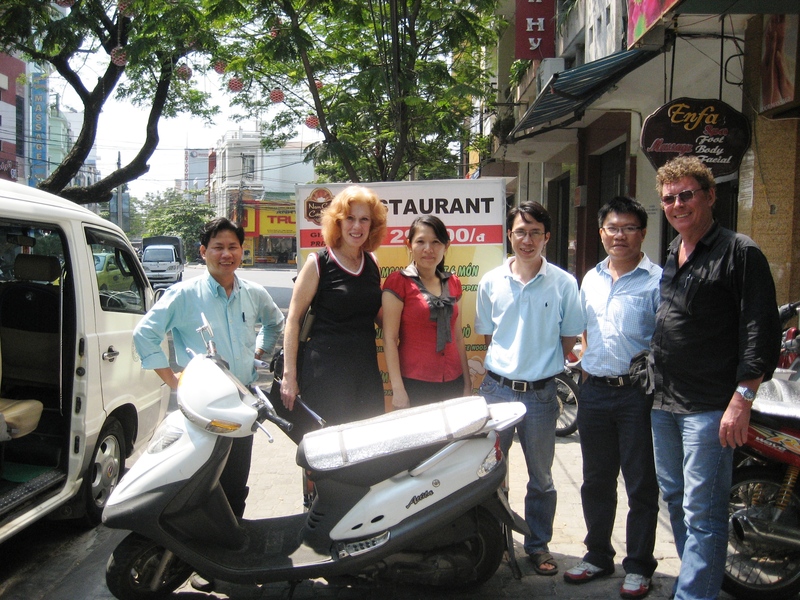 As we depart, the cameraman and I each hand the mother a few dollars in Vietnam dong and she thanks us profusely. Phuong runs after us with two of her drawings as gifts of thanks. The drawing she gives the cameraman depicts a house, a man inside at a door holding a suitcase. Three small children are behind him, one little girl with tears running down her face. Back in the van, I discussed with the staff how to help this lovely single (separated) mother of three, two of the children seriously disabled, all four living together in such deplorable conditions. One staff member has already petitioned local authorities for better living conditions and services for this family and even featured them in their literature, but so far no help is forthcoming. At least EMWF is providing Phuong with a multi-year scholarship for school supplies and expenses. Our final stop was at a center the Vietnam Veterans of America Foundation established for Agent Orange victims and other disabled. We spent a few hours videotaping wonderful programs here then meeting with the director, whose goal is to open many more centers. 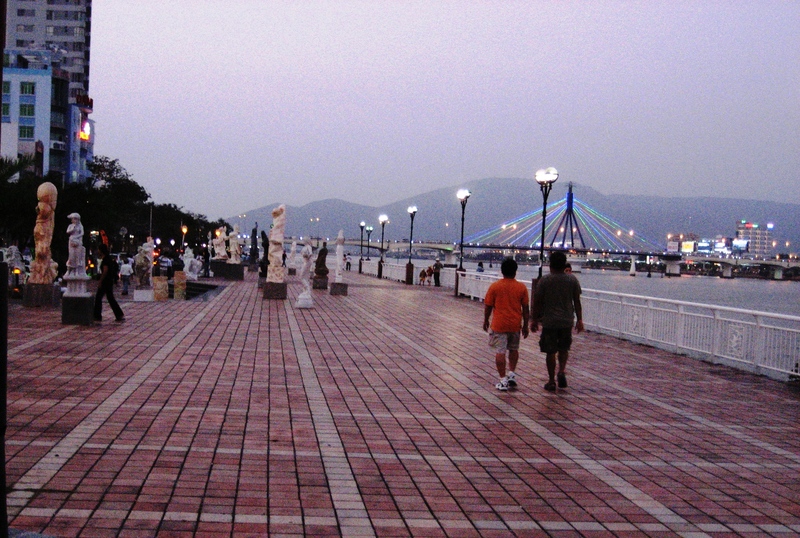 At the end of a long day, the van dropped me off at a lovely modern hotel across from a Da Nang river and boardwalk. I felt grateful to enter the clean, bright, modern lobby and my large room with a view and all the amenities. With dusk approaching, I needed to take a quick walk and change some money. 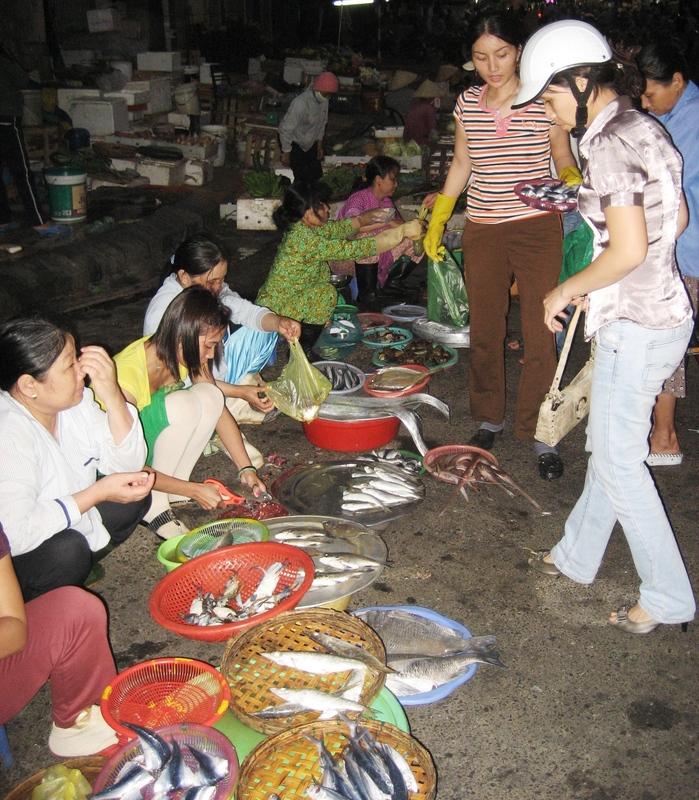 The adjacent street was teaming with women lining both sides selling fresh fish, fruits and vegetables. It was such a colorful collection of food that I bent down to get some shots with my camera. When I stood up, a mother and young daughter appeared magically before me. We stared at each other for a few seconds, confused, trying to recall why we look so familiar. Then, like in the scene with Drew Barrymore and “ET,” we screamed simultaneously in disbelief of the encounter. 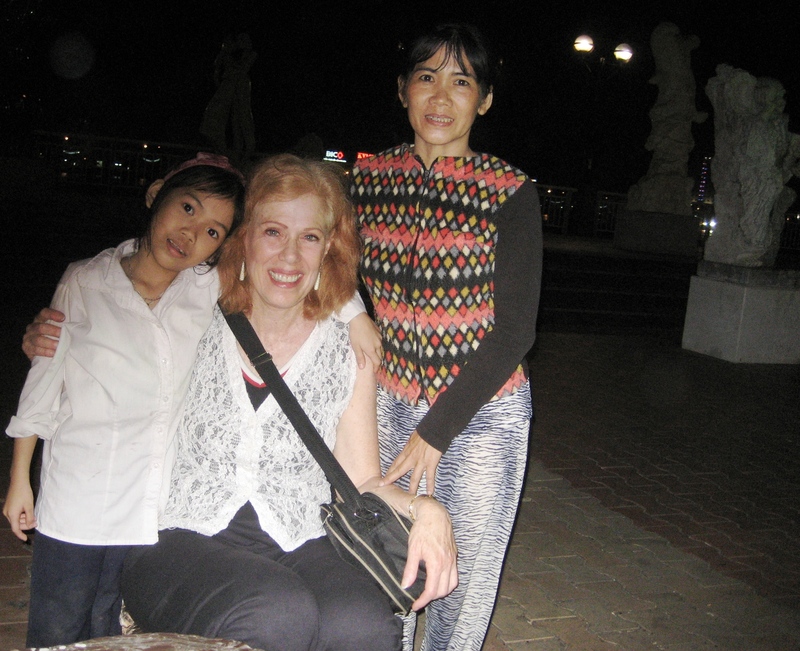 Phuong flung her arms around me; I almost crushed her prosthesis in the hug. Hearing all the excitement and commotion with the only Caucasian on the street, a crowd of women gathered around us. I asked if anyone spoke English, but not here. So I gave Mrs. Thuong some dong and gestured to buy food with it. Then I took Phuong’s hand and walked to the fruit section. I gestured while speaking in English that she should pick out her favorite fruits. She didn’t understand, but fortunately one woman who had just arrived understood and translated. Phuong picked tangerines, so I bought her a bag with the last few dong in my wallet. The child was so excited jumping up and down, gesturing to me and her mother that now we must cross the street and walk along the picturesque boardwalk. She placed the tangerines and her drawing paper and pencil on a stone table there, where her mother parked the rusty old bike that brought them. They were undisturbed by passers by. 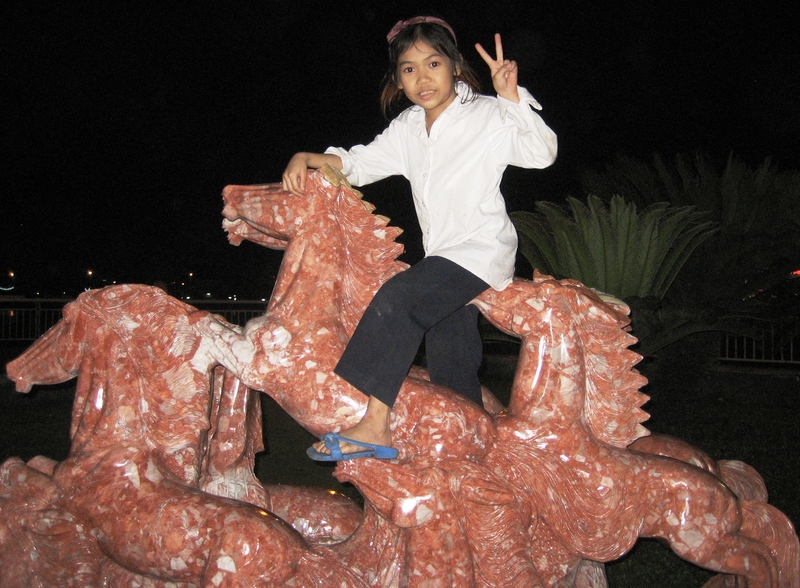 Despite her disability, Phuong flittered from statute to statue nimbly climbing them all along the boardwalk as I snapped photos of her. Like a kid in an amusement park, we rushed to keep up with her. How in the world can I do that? Just then a man with a big camera magically appeared on the boardwalk heading toward us. My translator explained that this man can take a photo and develop it immediately in his car. I gave the boardwalk photographer $2 to take a couple of shots of me, mother and daughter. He returned in a few minutes with a nice 5 x 7 photo of us, which I handed to Mrs. Thuong. She and Phuong admired it and thanked me.